I once attended a wedding where the minister was a pleasant young man from a traditional denomination. He conducted the service well enough but he made no reference whatsoever to the Bible, and the name of Jesus came up just once in a casual aside. A Christian marriage is based on the covenant between God and man as fulfilled in and through the Lord Jesus Christ, and it is described and prescribed in the Bible. How then can a minister of the church conduct a Christian wedding without reference to either the Lord Jesus or the Bible? This is by no means an isolated incident but is rather indicative of the sad lack of connection between Jesus and the Bible evidenced in much of the church of our day. This central ‘truth’ connection needs to be restored and I am committed to playing a meaningful role in the process. By the middle ages, Christian maturity was gauged by knowledge of doctrine and church protocol instead of the quality of a living relationship with Jesus Christ. And things haven’t changed much since then. In traditional churches the priest, pastor, minister is required to hold a bachelor of theology degree. This is good in itself but surely a mature relationship with Jesus is of greater importance? The answer to that question is often negative because the criterion for ministerial success has become what you know rather than who you know. Ask an average gathering of Christians if they are currently discipling anyone and a typical positive response would be one in a hundred. Jesus commissioned his followers to go into all the world and make disciples but so few of us do. Why is this? Again, ask a typical congregation this question and one of the most common responses is, “I don’t know enough”. What they mean by this is that they don’t have in-depth knowledge of the doctrines of the Christian Faith and nor do they have answers to the many objections they imagine others will raise. But Christianity is not a knowledge-based religion; it is a word that describes a relationship with Jesus and with other disciples. It is not a system to be sold, but a life of relationship to be offered. Thank you for a very interesting and meaningful article. 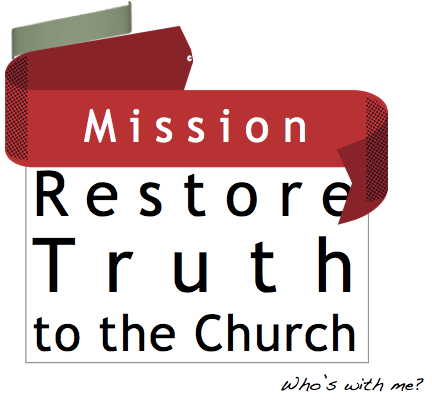 I also believe that the Truth (the Lord Jesus Christ) needs to be restored to His rightful place in the Church and individual Christians’ lives today. You briefly mentioned the issue of the opposition between cessationists and charismatics, calvinists and arminians. For a long time I have been wrestling with eschatology. I grew up in a church that taught premillennial dispensationalism. Over the past years I have come across many others that hold to this view. Through my theological studies, however, I have changed my eschatological stance. In my mind, not all of the different eschatological views can be true. The same goes for calvinism vs. arminianism and ‘charismatics’ vs. cessationists. Surely only one is true and the other is false? Sincere, Christ-loving, Bible-believing Christians truly have different views concerning certain issues. How exactly do you think these sort of issues might be able to change if we restore Christ to His rightful place in the Church and in our lives? Thank you for your comments Sean. My contention is that if we all started our study of theological issues from a Christocentric perspective, then we would be more likely to come to similar conclusions than if we start from the perspective of our particular denomination or theological model. When we develop theology Christocentrically, then the potential for widely divergent formulations is limited. The following definition is from a paper I am currently publishing titled ‘The Christocentric Principle – A Jesus-centred hermeneutic’. ‘What I refer to as the Christocentric Principle is an approach to biblical interpretation that seeks to understand scripture from a Jesus-perspective. In other words, a way of interpreting scripture primarily from the perspective of what Jesus taught and modelled, and from what he revealed concerning the nature, character, values, principles, and priorities of the Godhead. Thank you for your reply, Chris. I fully agree with you that all Christians need to adopt a Christocentric (Jesus-centred) hermeneutic. I have met some people who hold to certain beliefs simply because their particular denomination or ‘church covering’ has always taught and practised it. I have in my possession ‘Pagan Christianity’, by George Barna and Frank Viola as well as the sequel ‘Reimagining Church’, by Frank Viola. I have not read the books yet, but have read that some ‘traditional’ church doctrine and practice is challenged in these two books. If I am not mistaken, these books discuss ‘organic church life’. Have you read these books? If you have, what are your thoughts on them. ‘Pagan Christianity’ is a bit like an ecclesiastical enema. Read with discernment. In this book Frank Viola has a lot to say about what is wrong with what he calls ‘the institutional church’ but does not offer any viable alternatives. However, he poses a lot of questions that all church leaders need to be asking. ‘Reimaging church’ continues the criticism of the institutional church but in this book Frank presents ‘home church’ as the alternative. In the church where I am an elder we have been experimenting with Home Churches (as opposed to Fellowship Groups) for about five years. They do have strengths but they also have distinct weaknesses. Thank you for this explanation, Chris.